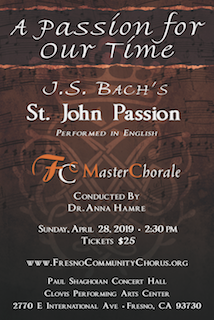 Join Fresno Master Chorale for a single performance of J. S. Bach's St. John Passion on Sunday, April 28, 2019 at the Paul Shaghoian Concert Hall at Clovis PAC. Soloists and full orchestra complete the ensemble. This seldom performed masterpiece will be presented in English.